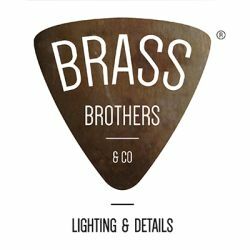 Brass Brothers & co. is a new young brand of lightings and furnishings, a common project born from ideas shared by a group of designers, architects, artisans and creatives. The proposed products carry with them the taste and the memory of our childhood, of the models found in the cellars of our houses and on the shelves of shops, but reinvented, redesigned and reworked in order create new forms. We propose a contemporary line of items with a vintage mood and an eccentric attention to materials, in which craftsmanship and design coexist and interact. Craftsmen and designers work closely together for the realization of prototypes intended for an artisan customized production. Brass Brothers & co. manufacture is entirely made in Florence and surroundings, entrusted to the hands of expert craftsmen with over 50 years of experience.